Control your AccuLink™ communicating system's energy consumption from anywhere in the world with any Internet-enabled smartphone, tablet or computer. ** Remotely control your home too, thanks to the built-in Nexia Bridge. 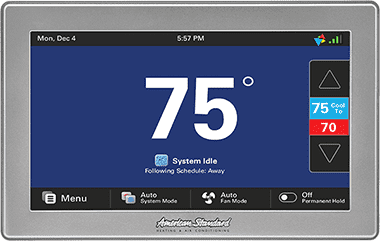 Deluxe, smart thermostat that puts comfort fully in your control. **Requires high speed router and connection to Nexia™ Home Intelligence.